The series of Forest Governance Zonal Workshops is organised exclusively for interested Malaysian Nature Society Members. To introduce participants to forest governance. To equip participants with knowledge, understanding and skills to foster better involvement in forest governance processes. 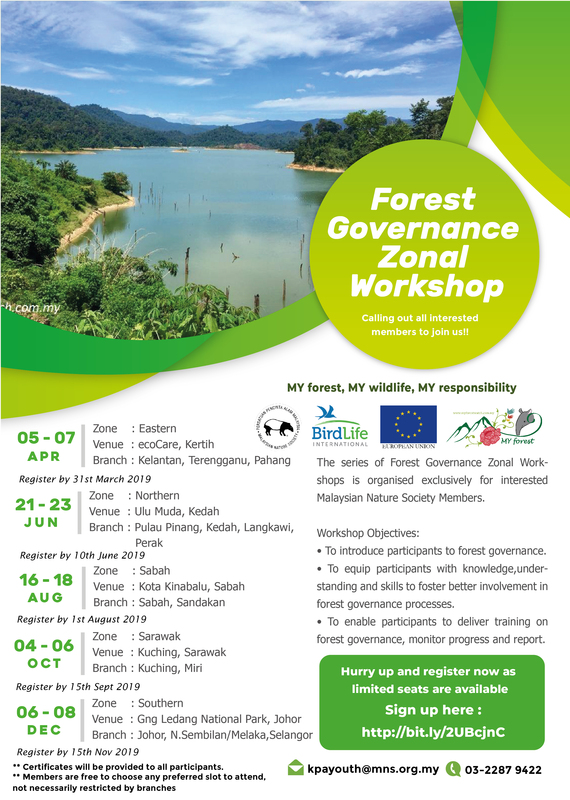 To enable participants to deliver training on forest governance, monitor progress and report. We would like to cordially invite interested MNS members to attend the workshop as the schedule above. The workshops will be held according to zones in Malaysia mainly for logistics purposes. However , you may choose to attend any preferred slots. All meals and accommodation throughout the workshop will be covered. University students are encouraged to apply as well. You are advised to bring along your laptop if you have one. Hurry up and register now as limited seats are available. The workshop is free of charge to all MNS members. Accommodation, meals and training material will be provided to all participants. Certificates will only be provided to participants who have completed the entire course. Transportation is NOT provided. Participants are responsible for transportation to and from the workshop. Call 03-2287 9422 or email kpayouth@mns.org.my for more info. Looking forward to see all of you there.